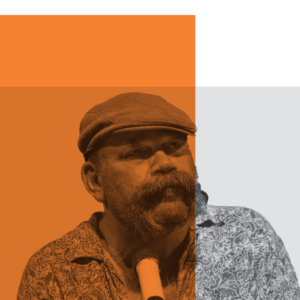 Acknowledged as one of Australia’s finest didgeridoo players, Mark Atkins is also recognised internationally for his collaborative projects with some of the world’s leading composers and musicians. A descendant of Western Australia’s Yamitji people, as well as of Irish/Australian heritage, Mark Atkins is known not only for his masterful playing, but also as a storyteller, composer, percussionist, visual artist and instrument maker. Through Mark’s lips the air blows as a natural desert sound, in old ethnic chants and in polyphonic melodies of astonishing rhythm. Mark Atkins has incorporated the didgeridoo sound into some unlikely musical environments, adding its primal pulse to orchestral works, theatrical productions and dance presentation. He has performed alongside and composed with artists such as Led Zeppelin’s Jimmy Page and Robert Plant, Sinead O’Connor, Philip Glass, Donald Lunney, Ornette Coleman, Peter Sculthorpe, the Blind Boys of Alabama, Gondwana, Jenny Morris, John Williamson, James Morrison, the Australian Chamber Orchestra (ACO) and many, many more. “Atkins is a phenomenal didgeridoo virtuoso, eliciting extraordinary colours and sounds” The Australian.